HV Arts Council Members: Buy your tickets here. Enter discount code SANTA and save $8/regular ticket. Regular tickets $35. HV Arts member tickets $27. And then purchase your tickets with the code. The Riverside Symphonia, conducted by Mariusz Smolij, will bring its annual holiday concert to Hopewell Valley for the very first time as part of its 27th season. 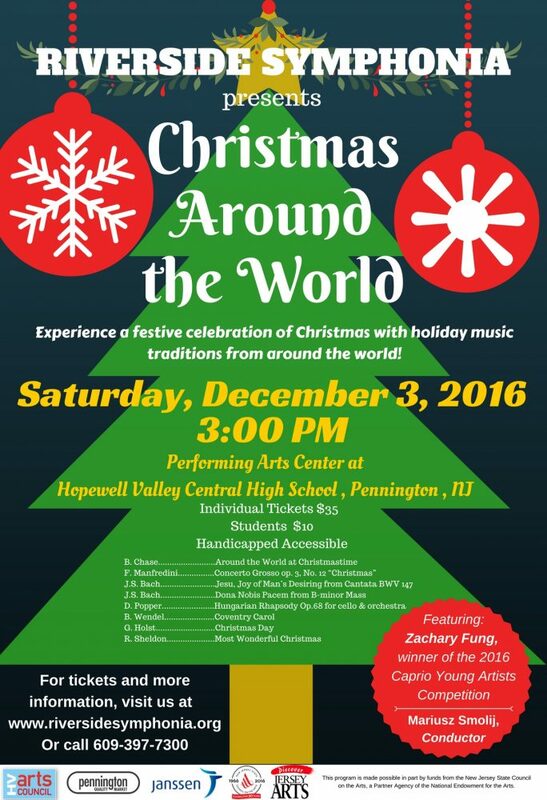 The Hopewell Valley Arts Council is thrilled to introduce the Symphonia to our area and help kick-off your holiday season. 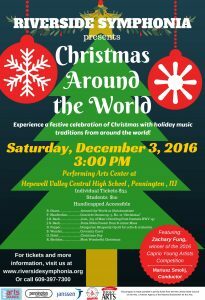 This festive celebration of Christmas will present holiday musical traditions from around the world, including audience favorites. The concert will feature both the full Symphonia orchestra and a youth chorus. The Riverside Symphonia premiered in 1990 and from the beginning has successfully provided first-class music, featuring a full professional orchestra, at prices within the reach of all. Through the years, the orchestra has received critical acclaim from the press, audiences, and peers. Mariusz Smolij, Music Director and Conductor, is considered one of the most talented conductors of his generation. Smolij also serves as Music Director of the Acadiana Symphony in Lafayette, Louisiana. He has served as Resident Conductor of the Houston Symphony and Assistant Conductor of the New Jersey Symphony. Since the 2002-2003 season, Maestro Smolij has been closely associated with the Wroclaw (Breslau) Philharmonic in Poland and has presided over the International Festival Wratislavia Cantans. HV Arts Council Members: Buy your tickets here. Enter discount code SANTA and save $8/regular ticket. Regular tickets $35. HV Arts member tickets $27. Not yet a member? Join now! And then purchase your tickets with the code.